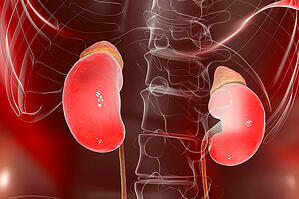 Diabetes: Diabetes is the most common cause of kidney failure. The results of the Diabetes Prevention Program (DPP) funded by the National Institute of Diabetes and Digestive and Kidney Diseases (NIDDK) show that moderate exercise, a healthier diet, and weight reduction can prevent the development of type 2 diabetes in persons at risk. Genetics/Environmental Factors: It has been established that genetic determinants greatly influence the development and progression of CKD. While it is not possible to alter a person's biology and genetic determinants, it has also been established that environmental influences and individual behaviors have a significant impact on the development and progression of CKD. As a result, some populations are disproportionately affected. Successful behavior modification is expected to have a positive influence on the disease. Too Much Protein: Over the past decade, several studies have shown that proteinuria (too much protein in the urine) predicts faster progression of kidney disease to ESRD. This is especially true in persons with diabetes. Fortunately, these and other studies have shown that drugs that reduce proteinuria can also slow the progression of established kidney disease. These drugs include angiotensin-converting enzyme (ACE) inhibitors and angiotensin II receptor blockers (ARBs). All racial and ethnic groups can benefit equally from these lifestyle modification programs. Volunteer organizations and communities around the country have launched programs that promote healthier lifestyles to prevent diabetes. These initiatives, community programs, and guidelines are consistent with the Chronic Kidney Disease objectives for Healthy People 2020.